Following the arraignment of the most recent former Acting Vice-Chancellor of Obafemi Awolowo University, Ile-Ife, Prof Anthony Elujoba, on Friday the 7th of July 2017, there was the staging of a protest on Monday by some members of the Academic Staff Union of Universities (ASUU) at the institution in solidarity. Prof Elujoba and the Bursar of the institution, Mrs Josephine Akeredolu “were arraigned before the court over allegations of corrupt practices and financial impropriety in the university, on a 7-count charge of intent to steal money belonging to the institution and conspiracy to defraud the school among others. But members of ASUU, OAU chapter yesterday (Monday 10th of July) protested against what they termed illegal and unwarranted detention of the former acting VC and the University Bursar”, according to Vanguard News. The Economic and Financial Crimes Commission (EFCC) alleges fraud and misappropriation of the sum of N1.4 billion belonging to the university while Prof. Elujoba was Acting VC, without the former being ignorant of the fact that the sum was paid out to striking workers, who have perennially felt aggrieved as a result of the highhandedness and insensitivity of past administrators, which the administration of Prof. Elujoba successfully assuaged and for which he is currently facing trial. 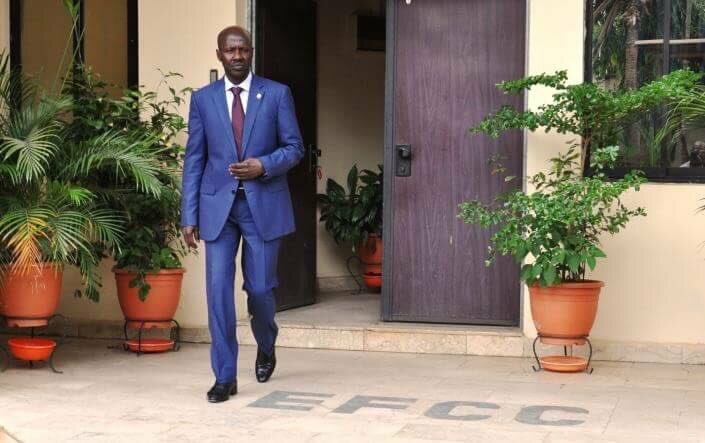 The scenario playing out very succinctly tells the story of how the hunter becomes the hunted; how corruption becomes a bull head-butting those whose wealth they have continually wallowed in; how “corrupt” former Vice-Chancellor(s) who have tactically or politically evaded being investigated and arraigned by EFCC turn around to be the ‘whistle-blower’ against an acting VC who beyond meaning well for his constituents, also enjoyed the popular support and likeness of the majority of the latter. This scenario, pointing elsewhere at the National Assembly of crooks, where the Economic Amnesty Bill aiming to extend amnesty to national looters and officially grant them the badges of honour has passed first reading, tells much of the weight of corruption in Nigeria. As if killing the hopeless was not enough! As much as this writer tends to be a nasty optimist in the Project Nigeria on right Tracks, scenarios such as this gives a different instruction where the vanguards of corruption, as we have been led to believe EFCC is, while losing almost all their corruption cases to corrupt people, listens to these same corrupt people for advice on who to arraign for corruption. Hence, sometimes as this, we see nationalists such as Prof. Elujoba, who was throughout his tenure widely and consistently given a vote of confidence culminating in the extension of his tenure with an additional 6 months and who should be made a model for good governance and prideful leadership, propped up by EFCC and goaded by past leaders of similar institutions who themselves need to be investigated. It is pathetic! What is the meaning of “In the interest of Justice”? Is it justice that workers of Obafemi Awolowo University, Ile-Ife be denied their rights in allowances and bonuses for several years? Is it justice that those leaders who denied the said workers of their rights walk free? Is it justice that the acting VC who attempted to redress the injustice of many years within 6 months be arraigned and imprisoned? Finally, is it justice for him to oppose the bail application on the ground that it is against the interest of justice? Again, what is ‘in the interest of justice’? However, irrespective of what the answers to those questions are, Justice Oladimeji adjourned ruling on the bail application till next Tuesday, July the 19th, ordering Prof. Elujoba to be remanded at the Ilesha prison, pending ruling on his bail application. As if providing answers to those questions, the premises of the Osun state high court in Ede was thrown into disarray this morning with workers and students of OAU, Ile-Ife who were in court for solidarity went berserk after the pronouncement of the presiding judge Justice David Oladimeji. While the protests continued for a long time, with the protesters vowing to resist the remand order with a promise to storm the Ilesha Prison, some of them who spoke with newsmen claimed Prof. Elujoba is not guilty of all the offences brought against him and demand his release. As a matter of fact, justice can only be seen to have been done when transparently the books of the institution are forced open “openly” and all administrations are investigated. EFCC should try to listen or to hear what she is listening to and act on same. The constituents of Obafemi Awolowo University, Ile-Ife have for a long time been crying under the weight of oppression and injustice being mete out to them by various past administrations of the University in the guise of varied misappropriation of funds, denial of their emoluments, lack of spirited good leadership, underpayment of salaries, highhandedness and insensitivity amongst others. In the midst of all such noise at investigating certain administrations especially that of Professor Tale Omole, the singling out of Prof. Elujoba is a pointer to witch-hunting, deafness, insensitivity, eye service or a combination of all and more on the part of the EFCC. Half a word they say is enough for the wise.